Be the first to share your favorite memory, photo or story of Lien . This memorial page is dedicated for family, friends and future generations to celebrate the life of their loved one. Visitation will be on Wednesday. March 20, 2019 from 11 AM to 2 PM at Lensing Funeral & Cremation Service in Iowa City, IA. 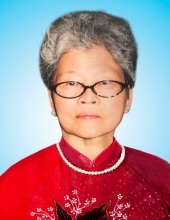 Lien was born on May 16, 1935 in Nam Dinh, Viet Nam, the daughter of Nhuong Cao and Hien Pham. She married Hien Hoang on October 26, 1954 in Saigon. They moved to Iowa City in 2001. Survivors include her husband and their children, Thuy Phillips of Iowa City, IA, Huyen Hoang of Romeoville, IL, Ha Hoang of Muscatine, IA, and Hai Hoang of Viet Nam; ten grandchildren and three great grandchildren. To send flowers or a remembrance gift to the family of Lien Cao, please visit our Tribute Store. "Email Address" would like to share the life celebration of Lien Cao. Click on the "link" to go to share a favorite memory or leave a condolence message for the family.